MAYOR of London candidate Brian Paddick promised tougher policies on drug dealers and knife crime if elected, when he paid his first official visit to Camden on Thursday. The Lib Dem campaign train pulled into St Pancras International station, with the former Holloway police officer pledging a “concerted effort” to clean up drug-scourged Camden Town. He said: “What you need around drug dealing is a concerted effort from the point of importation to the street dealer and you have to take out the criminal dealer network. “There’s no point in just tackling the street dealers. Mr Paddick courted controversy with his policy on cannabis use during his tenure as police commander in Lambeth, but he denied ever having a “softly, softly approach” to drugs. 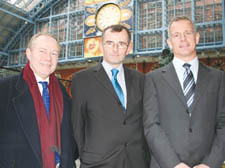 He held up the St Pancras station redevelopment as a model for regeneration across the borough. “Things like this development are changing people’s perception of Camden,” Mr Paddick said. “We need to look at how we can improve the environment to create that welcoming feel you get here.